WELCOME to our unique, multi-facet, immersion-style, indoor/outdoor learning environment that began in 2011. The program started simply for the first two years on our library windowsill with the 2nd grade to plant, learn and harvest rotational greens for school kitchen use. With this class I also began our food and palate development classes. Where students get to experience new foods, learn to prepare them and have simple discussions about food, labels and what one might see at the store. 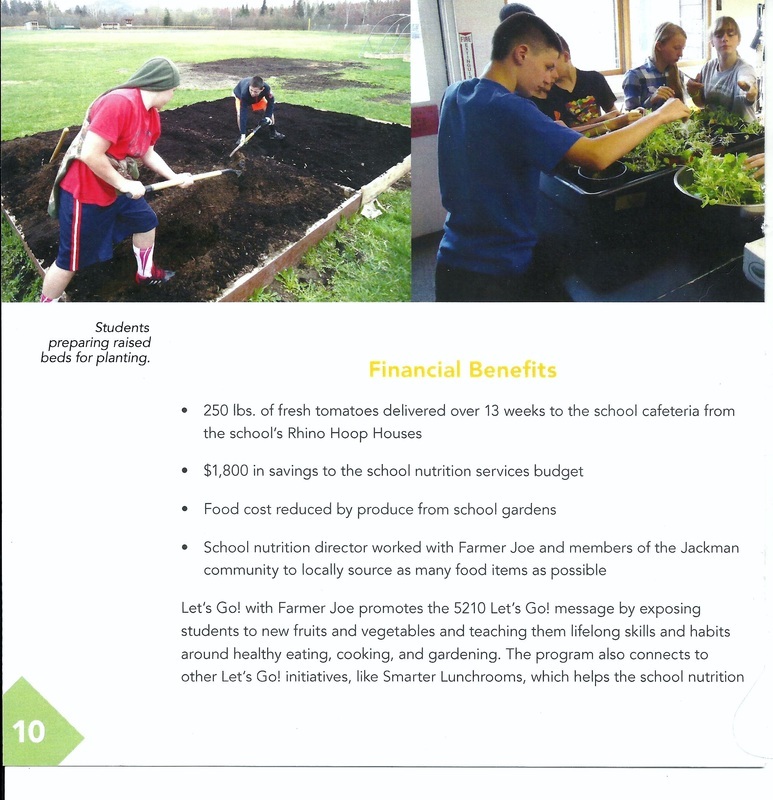 *The overall program design (which is continually updated and now considered Farm to School) is a replicable, immersion style Sustainable Agricultural/Culinary program using a 3 tier approach over a 3 phase outdoor development process for increased educational possibilities and food production for our school’s kitchen and finally to create a multi-grade, wheelchair accessible, weather tight outdoor classroom and an integrated program for Forest Hills Consolidated School. The Sustainable Agriculture program, primarily 7th / 8th grade, has developed into an educational, year-round (indoor/outside) food production along with multiple greenhouse operations, 2000 sq.’ garden area, Farmer Joe’s Spring 6 piece “at Home” Student Garden (7th yr.), 3rd summer Internship garden program, 70’ of Pollination gardens, University science /data projects and a 3 bay composting site to make top soil. Our Culinary Food/Palate classes have developed over the years from simple tasting of unique food items to hour long interactive culinary/cooking classes and simple garden projects with our 4th Grade. A BIG Thank You to all for your support in this endeavor and a Big Thank You for your interest in what our students are learning about………. Follow along the picture show path below and see all that has developed here at Forest Hills Garden and with the 5210 Lets Go with Farmer Joe Program. 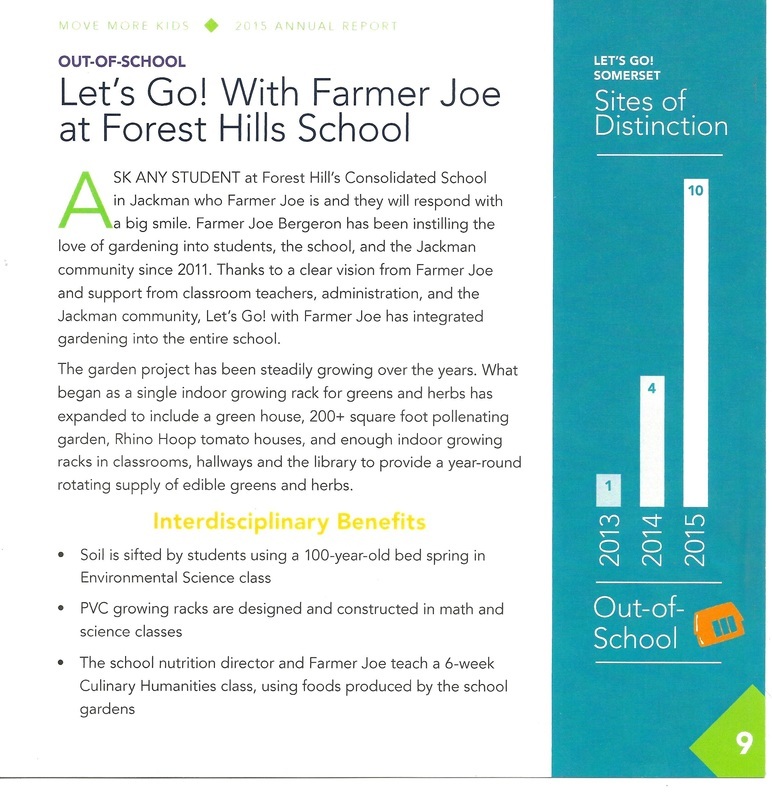 Below is a story from the New Balance Foundation -- Somerset Public Health Annual Report about Farmer Joe Bergeron and his wonderful efforts to provide students at Forest Hills an appreciation and love for gardening. We thank Farmer Joe for all of his efforts to help the students and the school.